Hillarys Marina is situated on the 'Sunset Coast' of Western Australia and is approx 15/20 mins drive from Perth City. Hillarys and the adjoining areas (Ocean Reef, Sorrento, Scarborough, Burns Beach) have some of the best beaches in Australia and cater for a number of watersports including wind & kite surfing. From Hillarys Harbour you can catch a ferry over to Rottnest Island or a charter for whale watching or sea fishing. 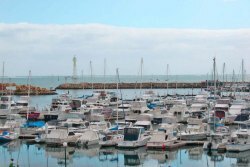 Fremantle is an easy 30 minutes drive south of Hillarys together with the Swan River and its numerous wineries.